In the past two months, teams wearing the Maple Leaf have won three of the four world championships (World Junior Women’s, World Junior Men’s, World Women’s) contested, and won a silver in the other (World Men’s). In Sweden, three quality teams will be on the ice for Canada — the pairing of Laura Crocker (Edmonton) and Kirk Muyres (Saskatoon) in the World Mixed Doubles Championship, and teams skipped by Edmonton’s Wade White and Saskatoon’s Sherry Anderson in the World Seniors. 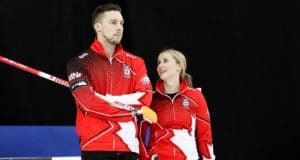 Crocker and Muyres won the Canadian Mixed Doubles title last month in Leduc, Alta., and, along with national coach Jeff Stoughton, will open their round-robin schedule at the Östersund Arena on Saturday at 6:30 a.m ET (12:30 p.m. local time) against Ireland’s Jen Ward and Eoin McCrossan. 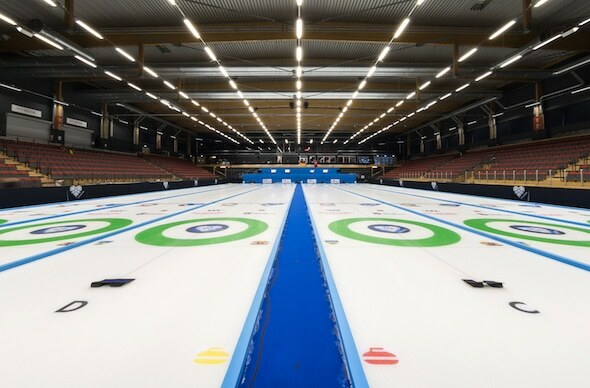 A total of 40 mixed doubles teams are competing in Östersund, and will be split into five pools of eight. Canada is in a pool with teams from Austria, Brazil, the Czech Republic, Germany, Guyana, Ireland and South Korea. While it will be the first time Crocker and Muyres have played at the World Mixed Doubles Championship, both players have competed internationally for Canada. Crocker skipped Canada at the 2013 Winter Universiade in Trentino, Italy, and also won a silver medal playing second for Team Rachel Homan at the 2010 World Junior Championships in Flims, Switzerland. Muyres, meanwhile, was vice-skip for Braeden Moskowy’s Canadian team at the 2011 World Juniors in Perth, Scotland. Canada enters the 2018 World Mixed Doubles Championship as the top-ranked country in the world in the discipline, based on World Championship and Olympic results. Earlier this season, the duo of Kaitlyn Lawes and John Morris won the gold medal at the inaugural Olympic mixed doubles competition in Pyeongchang, South Korea. 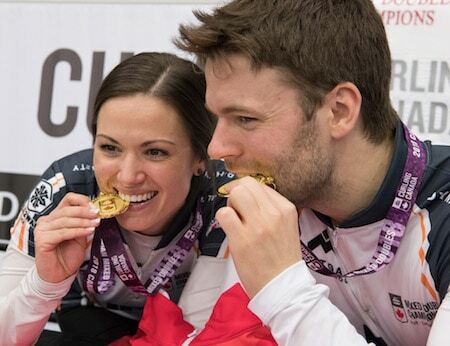 Last year in Lethbridge, Alta., Canada’s Joanne Courtney and Reid Carruthers won the silver medal at the 2017 World Mixed Doubles Championship. Canada will complete its round-robin schedule on Thursday at 6:30 a.m. ET against South Korea. The top three teams in each pool will make the 16-team single-knockout playoffs, as will the fourth-place team with the best Draw-Shot Challenge (pre-game draw to the button) total from the round robin. Selected games at the 2018 World Mixed Doubles Championship will be live-streamed on the World Curling Federation’s YouTube channel. Round-robin play goes through Thursday, with the playoffs starting Friday. Go to www.worldcurling.org/wmdcc2018 for information on the draw and a list of teams. The gold- and bronze-medal games are scheduled for Saturday, April 28, at 10 a.m. ET. Meanwhile, the 2018 World Senior Men’s and Women’s Championships will see Canadian teams looking to return to the podium after last year’s Canadian entries, skipped by Colleen Jones of Halifax and Ottawa’s Bryan Cochrane won gold and silver respectively in Lethbridge, Alta. Both Canadian teams won the right to represent Canada in Östersund by winning gold at the 2017 Everest Canadian Seniors in Fredericton, N.B. 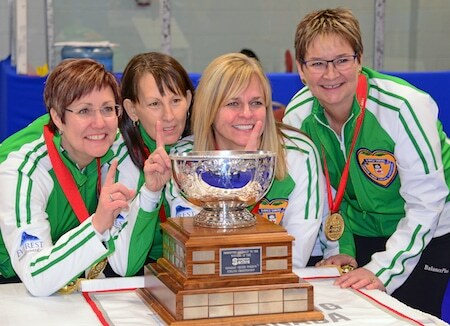 Anderson, backed up by vice-skip Patty Hersikorn, second Brenda Goertzen and lead Anita Silvernagle, has already booked a return trip to the 2019 World Seniors (dates, location TBC by the World Curling Federation) by capturing gold at the 2018 Everest Canadian Seniors last month in Stratford, Ont. The Canadian women are part of a 16-team, two-pool competition, with Canada grouped with teams from Australia, Japan, Lithuania, Poland, Russia, Sweden and the U.S.
Canada will open its round-robin schedule Saturday at 6 a.m. ET against Lithuania. Among the familiar faces in Östersund will be Swedish women’s skip Anette Norberg, who won gold at the 2006 and 2010 Olympics in addition to winning the 2005, 2006 and 2011 World Women’s Championships. The two pool winners will advance directly to the Saturday, April 28, semifinals (3 a.m. ET), while the second- and third-place finishers in each pool will meet in quarter-finals Friday at noon ET. 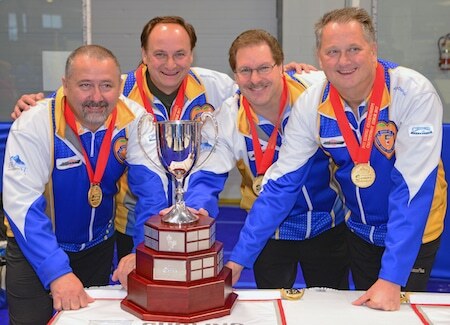 The Canadian team is seeking a leading 12th gold medal in the 17th edition of the World Seniors. On the men’s side, White, vice-skip Barry Chwedoruk, second Dan Holowaychuk and lead George White are looking to win Canada’s 10th gold medal, and first since 2014 when Wayne Tallon’s New Brunswick team prevailed at Dumfries, Scotland. 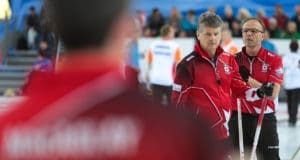 Canada has won men’s silver at the past World Seniors, with the most recent two championship final losses coming at the hands of Sweden’s Mats Wranå, who is chasing a three-peat in his home country. A total of 28 men’s teams are entered, split into four pools of seven. Canada’s pool is rounded out by Belgium, England, France, Germany, Switzerland and Turkey. Canada’s first game is against France Saturday at 2:30 p.m. ET. The four pool winners will be seeded directly into the quarter-finals Friday, April 27, at 2 p.m. ET, while the second- and third-place teams will meet in a qualifying round Friday at 6 a.m. ET. The men’s and women’s gold- and bronze-medal games are Saturday, April 28, at 8 a.m. ET. Both the World Mixed Doubles and World Seniors championships are open-entry events, meaning countries don’t have to qualify; they just need to submit teams. Next: Trio of 2019 Canadian Curling Championships to be decided in Fredericton, N.B.